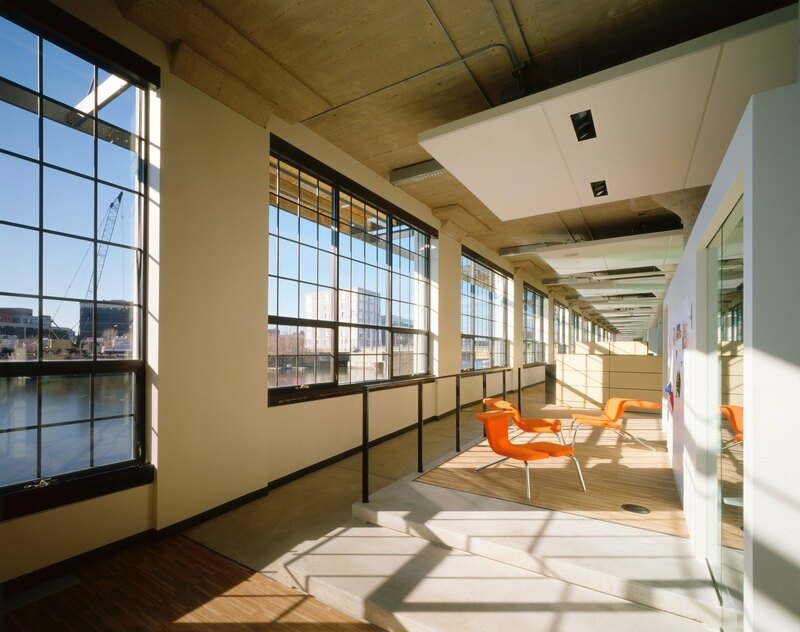 Formerly a warehouse connecting maritime shipping with ground transportation, this 200,000-SF adaptive reuse includes a two-story vertical addition with 83 housing units, ground-floor offices, and underground parking along the Milwaukee River. The glassy upper-level residential portion sets back from the brick-and-concrete structure. 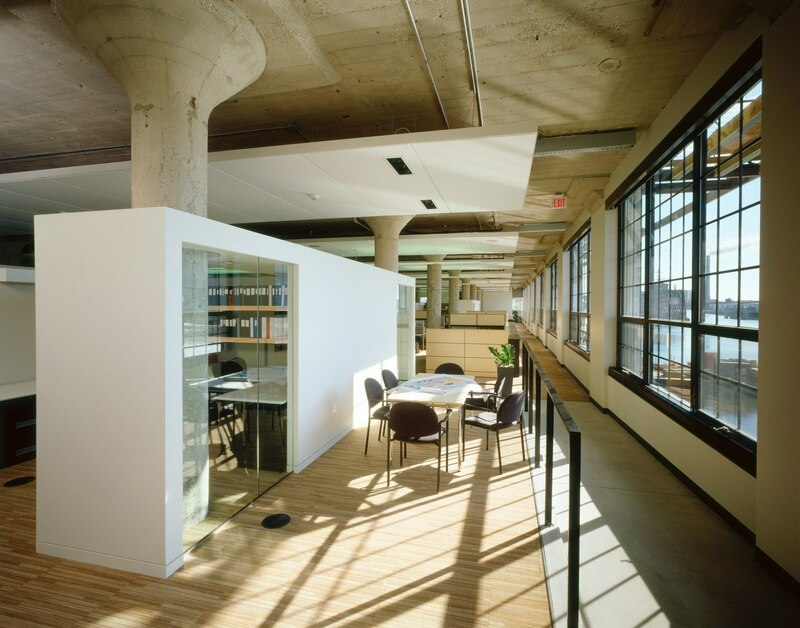 Two office tenants occupy the first floor, in­cluding HGA’s Milwaukee office. Inside, mechanical, data, and electrical infrastructure tucks under the raised floors. Aluminum-frame windows replace the original steel-sash window grid while retaining the historic character and offering expansive river views. 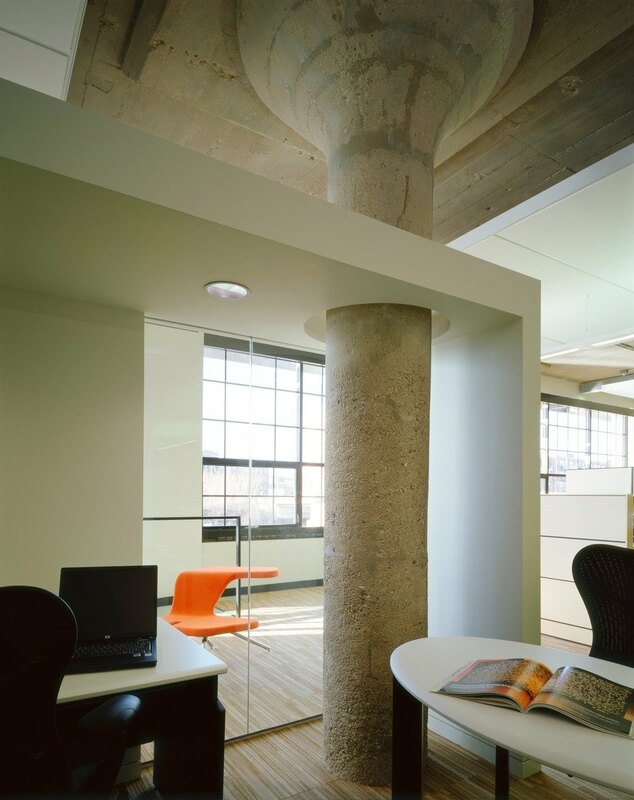 Exposed concrete pillars and ceilings maintain the building’s industrial past. 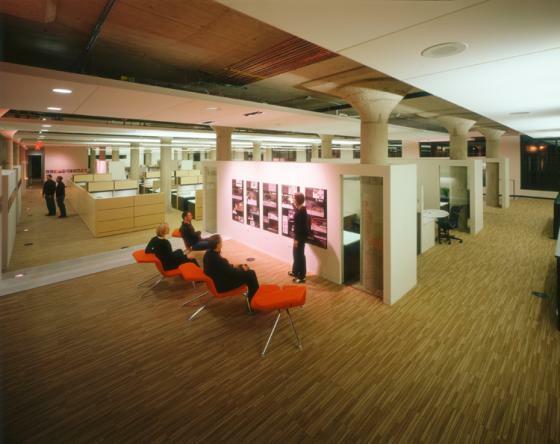 HGA’s Great Lakes office required a lighting system that reinforced the architectural rigor of the space while contributing to the project’s LEED Silver Certification. The connected load for the project—including conference rooms, display areas, and offices—is 1.17 watts per-square-foot. 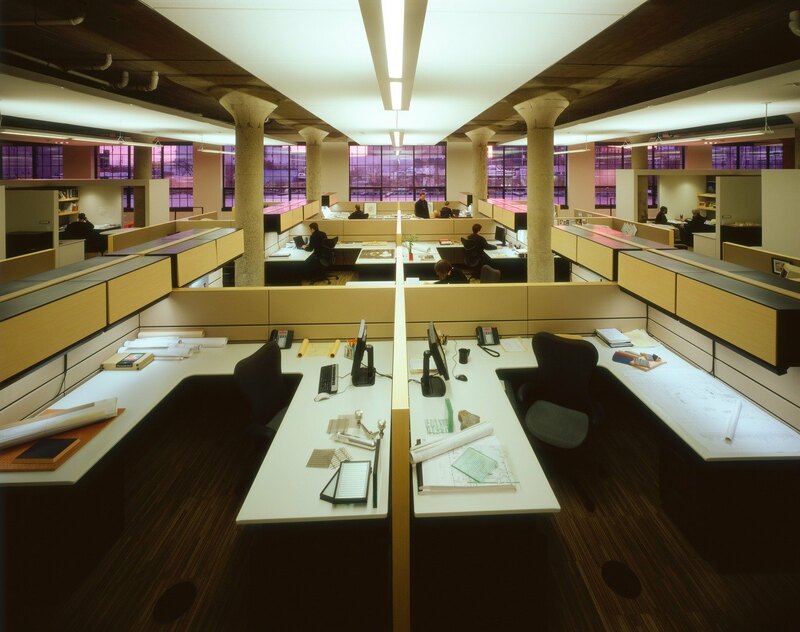 By utilizing an integrated lighting control system incorporating time-of-day, occupancy, and photocell functions, the actual operating load during daylight hours is 0.9 watts/SF or less. By selecting the most efficacious sources and control system, energy consumption is minimized while maintaining visual comfort and quality. 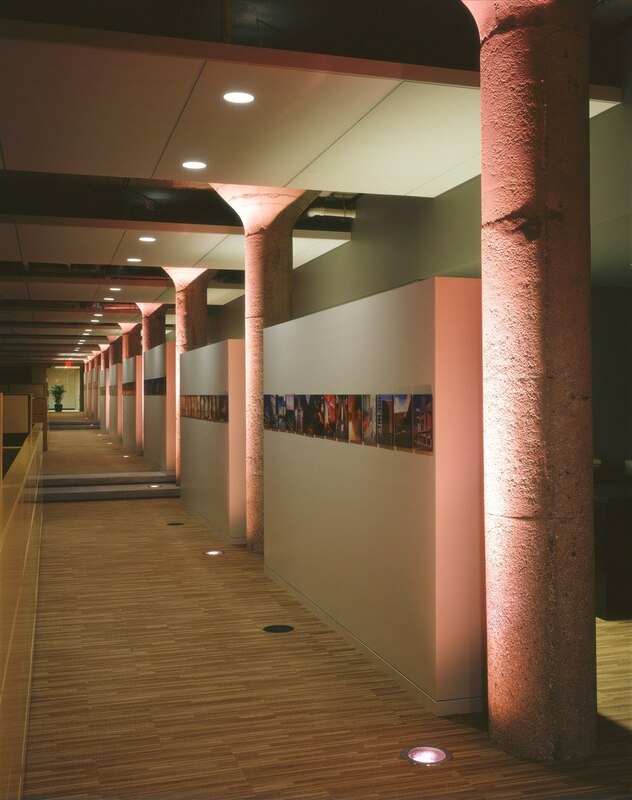 To accomplish this, a limited palette of luminaires and light sources provides illumination for tasks, highlights displays, and complements the architecture. Tailored forms, architectural integration, and maximum use of day lighting are the hallmarks of this design.